A delegation from the WBF attended the 12th annual SportAccord Convention that took place from 6 to 11 April in the seaside location of Belek/Antalya in Turkey. This edition attracted over 1600 attendees from almost 80 countries around the world, representing International Sport Federations and organizations, suppliers and delegates from numerous cities and regions, all related to and interested in sport and sporting events. The WBF Delegation was composed of Gianarrigo Rona, President, Marc De Pauw, Treasurer and Sevinç Atay, Executive Officer who attended the ARISF General Assembly, the IMSA Annual Meeting and the SportAccord Statutory General Assembly. 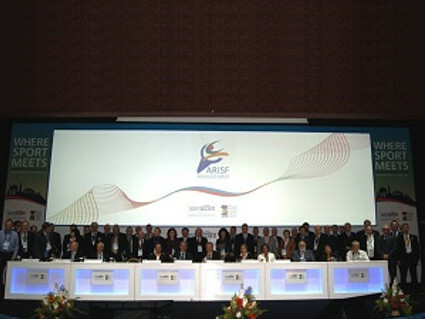 The convention was an opportunity for WBF to meet many different partners and to have very profitable private meetings with the SportAccord President Marius Vizer, the General Director Vlad Marinescu and the Sport Games Director David Nivelle; the ARISF President Raffaele Chiulli and Secretary General Riccardo Fraccari; the FISU Secretary General and CEO Eric Saintrond and the World University Championships Director Paulo Ferreira; the IMSA founder President José Damiani and the Deputy President Harry Otten. These meetings confirmed and reinforced the existing excellent good relationship the WBF has with these organisations and gave the opportunity to plan a programme of future common activities. 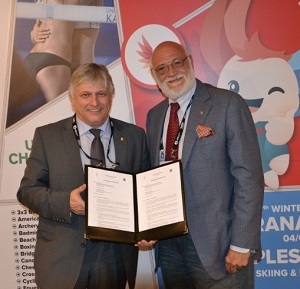 In particular the Joint Collaboration Convention was signed with FISU (pictured are Eric Saintrond (FISU SG/CEO) & Gianarrigo Rona): and the programme for the 2014 SA World Mind Games was defined with SportAccord. Several other meetings were also held with International Federations, Communications & Marketing and Media Companies to examine various aspects of potential common interests and future co-operation.